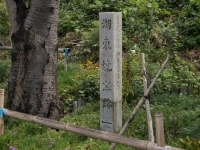 To the western side of the foot of Mount Sawayama, where the Omi Railway Main Line emerges from a tunnel towards Hikone, the remains of the very first koto-yaki kiln can be found. Koto-yaki is said to have begun in the latter half of the Edo Period, in 1829, when a merchant named Hanbei Kinuya decided to install a kiln to make porcelain, what was then the cutting-edge in pottery and art, and invited imari porcelain artisans to Hikone. Initially, a kiln was constructed on Mount Sarashi, on the southern edge of the Seri River, but a problem with the kiln caused it to be moved to a different location, to Mochinoki Valley at the base of Mount Sawayama. At the time, government support for domestic production was common amongst the various domains of Japan.Hikone Domain offered particularly robust support, and after ten years since production began, the pottery was given the names of Hikone-yaki and Koto-yaki. In 1842, under Naoaki Ii, the operation of the kiln was taken on directly by Hikone Domain. This Hikone Domain-operated kiln lasted for 8 years under the rule of the 12th castle lord, Naoaki, saw its golden age under the 13th castle lord, Naosuke, for 10 years, and its end after two years under the 14th castle lord, Naonori. Though koto-yaki saw a total of just 20 years of history, the koto-yaki kiln produced works of the highest standard in the world, not inferior to imari and Jingdezhan porcelain, and with minutely painted designs, sumptuous and refined, that established a flavor unique to koto-yaki. With the aim of creating pieces of pure excellence, a great many modestly beautiful pieces of pottery were produced: primarily porcelain baked white, and then adorned in various styles: gold-leaf, red ink and gold, small paintings; as blue and white porcelain, or as celadon. The pottery stone used to make koto-yaki was primarily sourced from Amakusa, and was mixed with a small amount of pottery stone from Hikone. Pieces made into blue and white porcelain were all fired in Hikone Domain's mountain kiln for tea bowls, while those made with red ink and gold leaf were fired with all their materials in the Domain kiln, and then painted later in a kiln specifically for painted pieces. Small kilns for painted pieces located within the castle town, or neighboring residences were known as brocade kilns, and pieces fired therein were called Minka (or "private home") Red Koto-yaki. 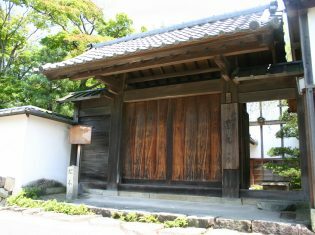 Just as Hikone was on the brink of establishing a sophisticated local industry on a grand scale, Lord Naosuke Ii was assassinated at the Sakurada Gate of Edo Castle in Tokyo, greatly changing the political state of affairs in Japan. Nearly 100 artisans from Hikone's tea bowl mountain kiln abandoned their posts in fear, leaving behind only four workers born in Hikone. This rendered production impossible, and the kiln was closed. Later, the kiln equipment and materials were purchased in their entirety by a man named Kihei Nakaguchi, but though the kiln was re-opened privately until 1895, there were no traces of the original koto-yaki produced therein. With 20 years in operation under Hikone Domain, and nearly 60 years of production including the private operations before and after Domain ownership, the sudden end to which koto-yaki came has led it to be called an "illusion" by some. Currently, there are efforts underway to revive the production of koto-yaki pottery anew.